During the e-Mission there are five student teams with 2 to 8 students on a team: Communications Team (2), Radiation Team (4-8), Storm Team (4-8), Life Suport (4- 8), and Crisis Management Team (5). The number of students in your class will determine the number of teams and student assignments. Each team should have a separate table or group of desks to work at. The Communications Team should be located towards the front of the room. The Crisis Management Team should be located in the back or center of the room. 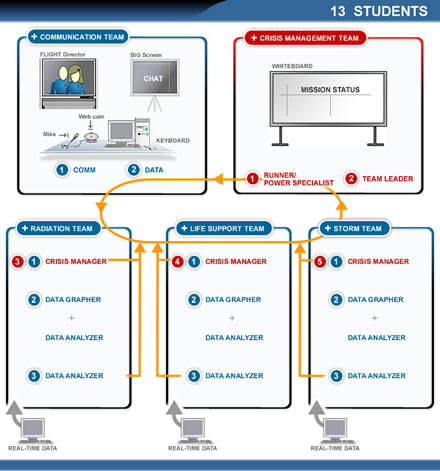 It is important to arrange the team areas in the room so that team messengers can walk to and from the other teams as needed, without interfering with the ongoing work and without tripping on computer or printer cables. In addition, the team areas should be positioned to allow everyone to observe the large projection screen in front of the class. Every four to five minutes the Storm, Radiation, and Life Support Teams receive data via computer. After a team receives its data, team members make the appropriate calculations, complete the charts and graphs, assess the situation, and complete Report Forms. The team messengers will take a copy of the Report Form to the Crisis Management and the Communications Team. The Crisis Management Team will analyze the situation based upon the reports it receives and then its messenger will carry a report to the Communications Team for transmission to Mission Control.